*This post contains Amazon affiliate links, however, as always, all opinions expressed in this post are my own. Books are always a welcome gift in our house. It's so lovely having something new to read to the boys for their bedtime stories each night, yet we always have our old favourites that we return to time and time again... The shelves in their rooms are full to the brim with books, but we can never resist buying more, because the gift of stories, imagination and made-up worlds full of adventure, is one of the greatest gifts we could ever bestow upon our children. 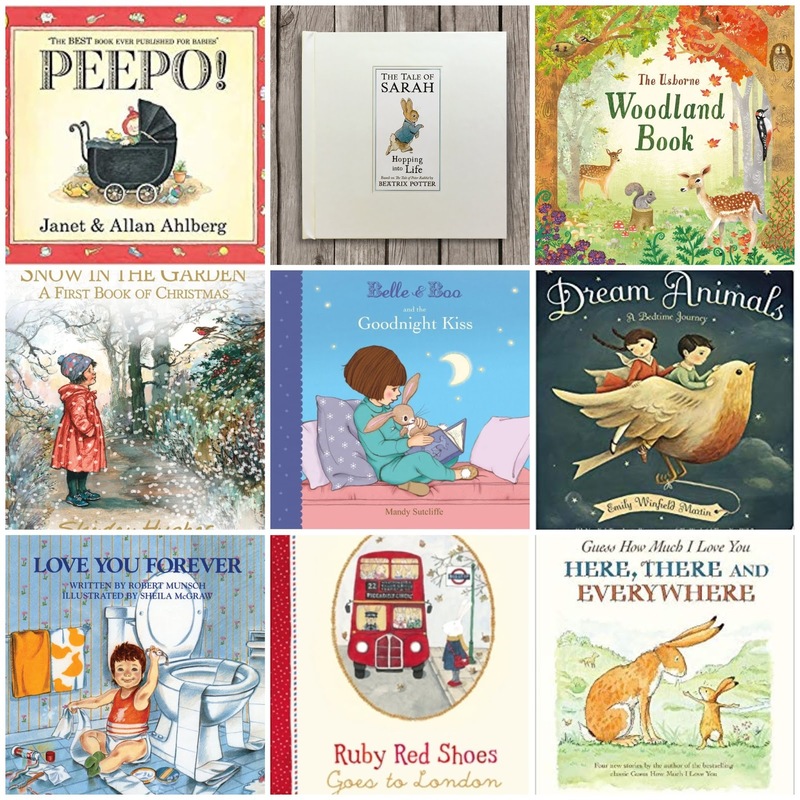 With Christmas coming up and my book wish list ever growing, I thought I would share some of the loveliest books for children, all of which have charmed us in one way or another. If you're looking for a beautiful, personalised, keepsake book for a child in your life then this book is just perfect! Not only does it contain the beautiful classic illustrations of Beatrix Potter's, it also has lovely little bits of life advice for a child to learn and think about as they read. I ordered Beau's from Signature Books and it arrived very quickly. The book also comes in a lovely box, which give it that extra special touch. This book is absolutely perfect for little nature lovers, with beautiful illustrations and guides to wildlife, plants, history and magic of woodlands. With this book, children can really learn how to explore nature by learning to identify tree, track animals, draw maps, build woodland shelters, etc. Not only is this book beautiful to look at, it's also a great learning source for children too, making it an ideal gift for little nature lovers. This is a book we do not yet have but which I have pre-ordered straight away after seeing a preview of it. I already love Shirley Hughes stories and this looks so beautiful with it's classic illustrations, stories and poetry. It would make an ideal Christmas gift for children and I cannot wait to read it with my boys. We love the Belle & Boo books so much and this one is particularly lovely for bedtime, teaching the lesson that a goodnight kiss is the most important end to the day. I love the charming little characters of Belle and Boo - they have the innocence that every child should have and everything about the story is so wholesome and lovely. A perfect gift for a bedtime story. This is another beautiful book in our collection and one we gifted Beau with for his 2nd birthday. The illustrations in this book are just stunning and again, the rhyming story is lovely to read. As it's a board book, it's perfect for even the littlest of hands to flick through on their own too. Tyler was gifted this book by his godmother when he was just a baby and it truly is one of the loveliest gifts he has ever received. The story never fails to bring a tear to my eye whenever I read it and it is the sweetest book that you could possibly ever read to a child. A book that should be part of every child's library! This book is new to my boy's library but I absolutely love it. It's hardback - which always seems to make a book that little bit more special and the illustrations are just gorgeous! Ruby Red Shoes is a hare and there's little quirky hare themed things in the book such as the London tube station names been given a 'hare-makeover' of sorts. This is a lovely book for children with an interest in or connection to London and it's also great as a Christmas story too. This is a book I've been reading to my sons ever since they were babies and it's one of the sweetest and classic children's books there is. The illustrations are beautiful, the story is heart-warming and the characters are endearing. It's a book that never gets old and one which I will always remember reading to my boys.